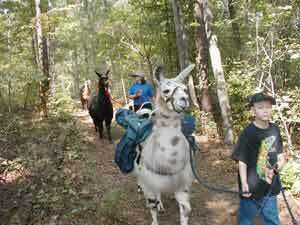 Of our original 8 llamas, we now have 4 stalwarts that love to hike. Three of our llamas are now deceased (Napoleon, Silver, and Domino), and one has gone into permanent retirement due to age related aches and pains (Jesse). Llamas have a very dignified and regal presence. They are extremely intelligent, very graceful, and carry themselves with elegance. A gentle companion for old and young alike, they are relatively easy and inexpensive to keep and easily trained. One of the most endearing things about our llamas is their curious nature. Many people compare the personality of llamas to that of cats, and in many ways we see that in our llamas. Most of our llamas are shy and aloof, but their curiosity wins out when they are confronted with something new and different, or when strangers come to visit. Each of our llamas has a unique personality. Coffee Bean has learned to open doors, Santiago enjoys going for a jog, but Jesse likes to stroll leisurely along the trail. Some of our llamas enjoy working for a grain reward, and others, like Santiago, are very proud and refuse to be bribed. Understanding what motivates a llama and learning all of their quirky behaviors is what makes being around them so much fun. Our first 4 boys, Santiago, Coffee Bean, Napoleon and Domino were brought to the farm in 2001. When we first started looking for our llamas, our goal was to find llamas with the right temperament and conformation that we felt would take well to packing. We have 20 acres here on our farm, and have created about a mile of trails that we use to train the boys. There are creeks to cross, and the occasional fallen tree to go over or under. 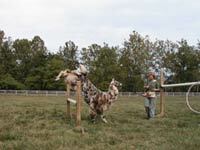 We have also built an obstacle course in the pasture that we use in their training. In the early years of training we entered them in shows and competitions where they got to compete against other llamas and were judged on their ability to safely maneuver around and over obstacles and obstructions. Our boys have won several ribbons in these competitions. We have also entered two of our boys in a packing trial sponsored by the Pack Llama Trial Association where they are tested on their natural ability and acquired training under realistic trail conditions. We have been very satisfied with our selection of llamas. All of the boys have taken naturally to carrying a pack and walking in the woods. they each have their own individual personalities, but they all are smart, gentle, and enjoy hiking with people. DOB May 8, 2000. Santiago is our lead llama, referred to as the "alpha male" in a llama herd. He is always the first to come to the fence to greet visitors. He’s a good-looking fellow with great conformation. He's easy to spot as the alpha llama because he always stands tall and proud. He easily carries the heaviest packs which are the coolers with all of the food and usually insists that he walk first in line. Santiago is very protective of the rest of the herd. He is always the first to give the alarm call and will often stand guard while the others eat their grain if he has heard or seen a wild critter about. He's also insists that he gets first choice of the food bowls. 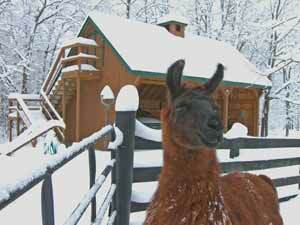 Santiago came from Shangrila Farm Llamas in Callaway, VA.
DOB April 28, 2000. Coffee Bean is half brother to Santiago. They had the same father and were born a week apart. They continue to be best of friends. Coffee Bean is our most laid back llama. He's easy going and will follow you anywhere. He has huge Bambi eyes that will melt your heart. Coffee Bean is a prankster. He loves to steal ball caps right off your head. He’s learned to open the door to the tack room and flip the lid off the grain barrel. You’ve really got to keep a close eye on him to keep him out of mischief. Coffee Bean loves to eat and he especially likes pine needles. He will stop along the trail to grab a mouthful any chance he can get. He's a real sweetheart if a bit of an imp. Coffee Bean also came from Shangrila Farm Llamas. DOB October 28, 1998. 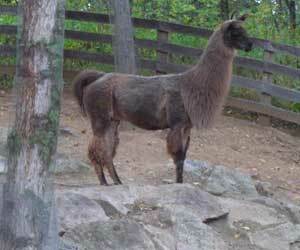 Prince came to us in 2004 from Graustark Llama Farm in Bluemont, VA. He was in their 4H program for 2 years and so is used to being handled by young people. He is the oldest, but one of the smallest llamas on our packing team. He has very unusual coloring, black with silver mixed in. Prince is a bit shy at first, but he quickly warms up to his hiking partner. He is not a complainer, and follows wherever he is led. He is a very smart and willing llama. He is particularly good for young people, or people who have never been around large animals. He is very gentle and easy to handle. DOB Sept. 29, 2001 (Sol Orr's Pete Rose). Pete came to us in March 2006. Pete is our smallest llama. He's jet black and has the shiniest and softest fiber. He's very popular with the kids. 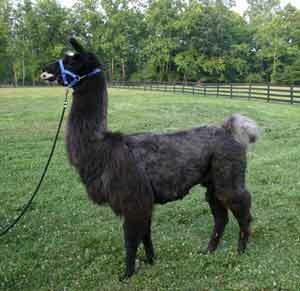 He came to us from the Graustark Llamas 4H program. Pete is super sweet. He is very curious and loves to greet visitors with llama "snuffles". That's a typical llama greeting where he puts his face close to yours and blows soft warm air in your face. He had been entered in performance competitions with the 4H kids, but had never worn a pack. We introduced him to a pack before his first hike with us, and he wore the pack all day like he had been born to it. We love Pete and you will too. Some people say that llamas are aloof and standoffish. They don't have to be. 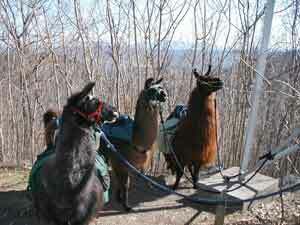 Click here to see additional photos and read about our Companionable Llamas. DOB April 6, 1999. RETIRED FROM HIKING. 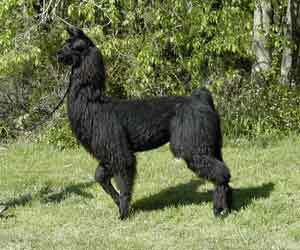 Jesse also came to us from Graustark Llamas and had also been working with the 4H group. In herd rank, Jesse is the last in line. Don't feel sorry for him though, he likes it there. Some llamas were meant to be leaders and some to be followers. Jesse definitely likes to follow. He's last into the barn for his grain, and he walks last in line on the trail. That's an important attribute, though, because some llamas don't like to walk in the back because they feel too vulnerable. Jesse is a chow hound, or chow llama, I should say. He stays on a perpetual diet to keep him fit and trim. Jesse is shy, but very endearing. DOB October 13, 2000. RETIRED FROM HIKING. Silver is our newest Llama. We brought him home on September 12, 2009. We had admired Silver for several years, and when his previous owners decided to sell the farm and all their llamas due to health reasons, we jumped on the opportunity to own him. Silver was owned and trained by Gwen Hayes and Clyde Humphreys of West Wind Llamas in Castleton, VA. Over the eight years that they owned Silver, they entered him in over 100 competitions and I think he placed in every one. They gave us a huge box of ribbons. Silver is a dream to walk with. 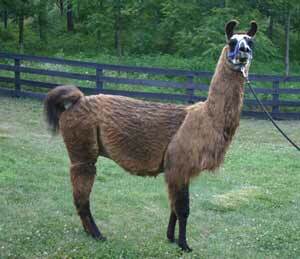 Marty McGee-Bennett (nationally known llama trainer) once said of him, "He leads like he has power steering." We're very happy to add him to our pack string. October 2000-November 2016. We are so sad to say goodbye to Domino. 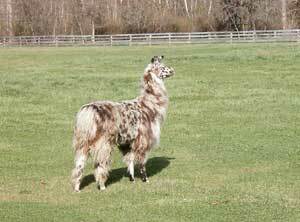 He was a gorgeous appaloosa llama with absolutely beautiful coloring and thick luscious fiber. 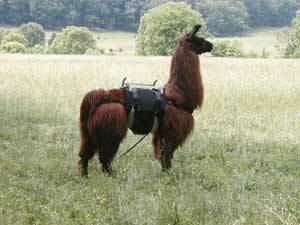 He once won the 1st place ribbon for best llama fleece at the GALA llama conference. He was our largest llama, but a big pussycat. I will always remember how he loved to play "sprinkle toes" with the garden hose. We will greatly miss that big galoof. 2000-2014. We are sorry to say goodbye to Napoleon. He was our sweetest llama and would do almost anything you asked of him. He passed suddenly of no apparent cause in July 2014. We will miss you, Napoleon. You will always have a very special place in our hearts.